Arrive anytime between 9 a.m. to Noon to launch. *This is our first year to offer launching without reservations from our location past Summer season. Thursdays through Sundays are trial days and may change. It is impossible to update all web entries/info. It is best to phone and listen to voicemail message for most up-to date days/ hours of operation. Expect that we will close during inclement weather (temps lower than 60 and winds higher than 15 mph, small craft advisories etc. ) Please refer to weather radar for the Bon Secour/Foley, AL area prior to arriving. No Facebook or email reservations accepted. Please Review “Float Rules” and “F.A.Q” PRIOR To Arriving. Be aware that the tide is lower and the water more shallow this time of year. This means you may be required to portage (walk, floating your kayak), through shallow spots or upon your return to the launch site. If you are sensitive to cold make sure you wear diving boots, gloves and appropriate layers of clothing. YOU WILL GET WET! It is strongly advised to read all F.A.Q. and SUGGESTED ITEMS TO BRING (listed under guided tours) for maximum comfort. Please consider that this excursion is more physically demanding — as you may need to walk several yards in soft, wet/cold sand. Upon arrival, please HONK LOUDLY — then remain in your vehicle until River Rick greets (approx. 5 min.) to distribute waivers and designate parking near the launch. To “get on the water faster” please come prepared with exact cash and Marine Police Info: Name, Address, Tel, Driver’s License #, Vehicle Make/Model/Tag # and of all participants printed neatly on a piece of paper (this is important — it is what is given to the Marine Police should anyone have difficulty on the water). You will sign waivers of liability upon arrival. The gravel road is PRIVATELY OWNED. There is No Outlet, NO WATER ACCESS and No Water View. Please respect our neighbors’ privacy (they are not kept abreast of our business) and all posted “No Trespassing” “No Parking” signs. DO NOT ENTER ONTO OUR PROPERTY (by foot or by vehicle) when chains/”Closed” signs are posted. 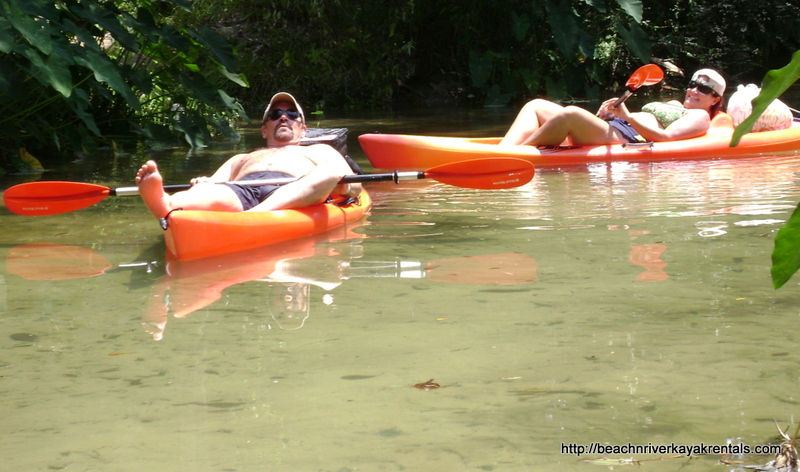 BeachnRiver Kayak Rentals is NOT OPEN FOR TOURS or viewing of property. Our launch area does not offer a view of the river. There is not a place to walk-up or drive-up that offers you a view of the river you will be paddling on. Please review testimonials/reviews/videos posted on website for an idea of what to expect. PROPERTY IS POSTED. CAMERAS ARE IN USE. Law Enforcement will be contacted with authority to arrest if caught trespassing. WARNING: THERE ARE NO PUBLIC PARKS FOR PICNICKING/SWIMMING/CAMPING/OFF-ROAD VEHICLE USE OR PUBLIC LAUNCHES FOR KAYAKING/CANOEING/S.U.P. ON THE BON SECOUR RIVER OR ON ANY OF ITS TRIBUTARIES. PROPERTY OWNERS REPORT ANY AND ALL SUSPICIOUS ACTIVITY TO LAW ENFORCEMENT WITH AUTHORITY TO ARREST TRESPASSERS WITHOUT WARNING. ILLEGALLY PARKED VEHICLES WILL BE TOWED AT OWNER’S EXPENSE. SOLICITATION OF ANY KIND BY PHONE, EMAIL OR OTHERWISE IS STRICTLY PROHIBITED. Thank you so much for your interest in BeachnRiver Kayak Rentals — the most family-fun water adventure in L.A. (Lower Alabama) “off the beach.” This year we are allowing our guests the opportunity to kayak up to 7 hours for the rate of $35 per single kayak/$75 per double kayak. Our first launch during summer months is 7 a.m. daily except Mondays — with half-hourly scheduled launches until 10 a.m.
All kayakers must return to the launch-site prior to 3 p.m. The rates will apply whether kayakers choose to kayak for 1 hr. to 7 hrs. No discounts will be offered. Only confirmed reservations will be allowed to enter our property. Our same rules apply: NO ALCOHOL, NO SMOKING, NO CUSSING, NO PERSONAL KAYAKS/CANOES BROUGHT ONTO OUR PROPERTY with NO EXCEPTIONS. The website will be updated very soon.